There are many things to consider when choosing your hermit crab's substrate. Not only must he be able to tunnel through it, but it must help maintain a proper level of humidity in his crabitat. Dirt is just one of several options for Hermie's safe home. When you choose Hermie's substrate, keep in mind that he'll be spending a lot of time buried within it in a vulnerable state. The substrate provides the darkness he needs to molt as well as protection from other crabs when he's most exposed. The substrate also acts as insulation and provides protection from the elements and dehydration while he's buried. The Hermit Crab Patch offers a table of guidelines for substrate depth requirements for different sizes of hermit crabs. As a rule, dirt is a good substrate for a hermit crab. Hermie should be able to breathe just fine in the dirt as long as he can tunnel through it without it collapsing on him and blocking his access to oxygen. If you want to use dirt from your yard, it's extremely important to make sure that it's never been treated with pesticides or fertilizers, as they can kill Hermie. Sand is a great option for a substrate, and many varieties are available specifically for crabitats. Although it's handy to buy "hermit crab sand," you can save money buying sand from a hardware store. If you choose to buy anything but hermit crab sand, do some basic checking before you add it to the crabitat. Smell it to ensure it doesn't have a strange smell -- it shouldn't smell musty or oily. Also, pour some in a bowl and sift it through your fingertips, looking for insects. It's not unusual for bugs to find their way into sandbags, and that could be trouble for Hermie. The benefit to sand is that it's easy for Hermie to burrow into it without the sand collapsing on top of him. It's also inexpensive. If you choose sand as a substrate, make sure to provide enough for your crab to adequately bury himself. Don't forget to add water for moisture -- it should have a sand-castle consistency. Coconut fiber, also known as forest bedding, is a popular choice for a substrate. This material is very finely processed coconut pressed into a hard, dry brick. When you're ready to build your crabitat, moisten the coconut with water so it can be broken apart with your hands. Over time, the coconut fiber stabilizes and allows the crabs to tunnel through it easily without collapse. It's also a good medium for maintaining the proper moisture level in the crabitat. Unfortunately, it's also attractive to fungus gnats, which may also want to take up residence in Hermie's home. Coconut fiber on its own isn't ideal for molting hermit crabs, as it doesn't offer them the best protection against predator crabs when they molt. The best substrate choice is a combination of sand and coconut fiber or soil. This provides a sand/soil mix that best mimics Hermie's natural environment. If you choose a mixture, prepare your coconut fiber -- or gather your yard soil -- and mix it with sand until it's a diggable consistency. Again, the best gauge is if you can build a sand castle with it. A mixture of sand and soil or fiber will give Hermie a good tunneling substrate that helps maintain the correct level of humidity in his crabitat. Although dirt will work as a substrate -- if it's free of pesticides and fertilizers -- potting soil does not make a suitable substrate. Other unacceptable options include gravel, pebbles, moss and wood shavings. Some have dangerous chemical additives and others aren't suitable for digging and moisture retention; still others promote bacterial growth. 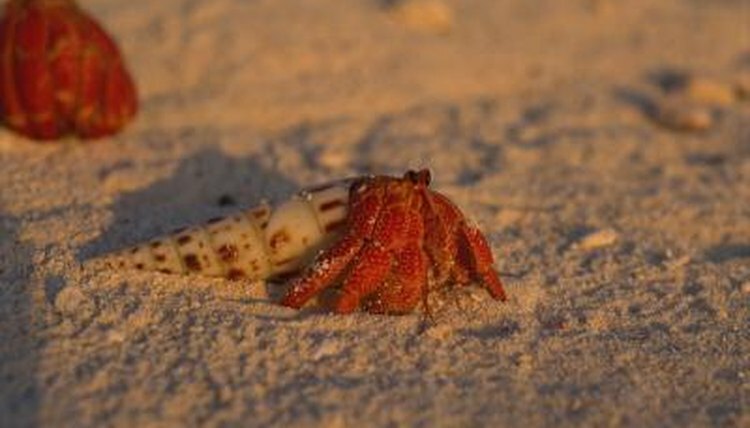 Calcium sand, which is often sold for hermit crab use, is not a suitable substrate. This powdery sand will stick to Hermie's moist abdomen and won't allow him to tunnel and re-surface after molting.